The Ruth Funk Center for Textile Arts is dedicated to further­ing the understanding of cultural and creative achievements in the textile and fiber arts through public exhibi­tions and educational programs. The Center preserves and displays an international collection of textiles through rotating public exhibitions and educational programs including free lectures and events for the campus community, work study and volunteer opportunities for students and free admission for the general public. 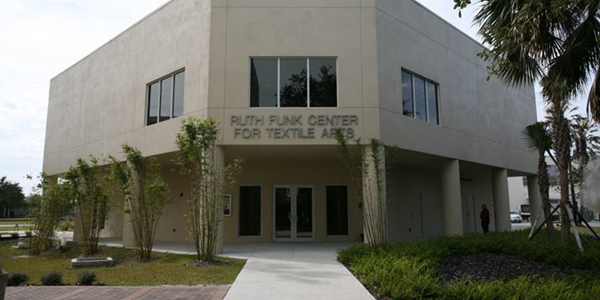 Founded in 2009 as Florida’s first textile museum and one of few in the nation, the Center houses innovative travelling exhibitions; secures the maintenance and preservation of Florida Tech’s growing permanent collection of textiles; and provides quality educational programming to the University community, members, and friends. Support plays an invaluable role in our continuing success and momentum. We offer the following naming opportunities to advance the Center’s institutional goals. Contributions will support the museum endowment and enhance the demonstrated impact of the Center’s exhibitions, programs, and strategic initiatives. The Center’s formal exhibition space measures approximately 3,000 square feet and is divided by temporary walls into three distinct “galleries.” Rotating exhibitions are presented three times annually, corresponding to the university’s academic calendar (spring, summer and fall), and thematically highlight the artistic, cultural, and technical significance of fiber art. In addition to exhibition objects, the gallery space may also serve as a site for gallery talks and tours, special events and unique exhibition-related activity stations. The Center’s second-floor balcony leads into the formal exhibition space and overlooks the museum lobby. Special events and receptions are generally held in this space. When not in use for formal events, this versatile area acts as a respite for reading and reflection and may occasionally feature artwork and/or exhibition-related activities. The Center’s lobby is the main point of entry for public guests of the museum. It features the welcome desk, sign-in book, information table, and digital signage highlighting the gallery’s featured exhibition, related programming, and member support. The lobby is also home to the Center’s museum shop which markets merchandise from local artists and artisans. The Center’s permanent collection is housed in its environmentally-controlled storage area (approximate 1,250 square feet). The collection contains traditional handmade textiles, embroidery, garments and related accessories from Africa, Japan, India and Central Asia; European and North American embroidery and samplers from the 16th through the 20th centuries; and contemporary wearable and fiber arts. The space requires a combination of storage systems (shelves, hanging rods, etc.) based on the needs of specific textiles—their size, construction and condition. Collection storage also serves as a receiving area for incoming, traveling exhibitions and a critical work site for the creation of exhibition mounts and materials. The administrative workplace contains a shared communal space and two offices. This area is the primary working site for the Center’s staff, volunteers and students. In addition to serving as a space for clerical duties, the room is utilized by museum docents who check-in and gather materials such as tour information, assigned readings, and other updates from their designated station. The area also houses the Center’s industrial freezer – an important step in the processing of donated textiles before they enter the permanent collection.